This is an opportunity to come and meet/chat with other residents from our village. The event is free to attend. There is also a raffle so come along and try your chances. 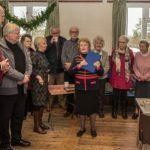 We are part of the Three Valleys Benefice. 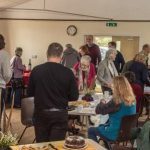 6th October – 7pm Harvest Festival followed at 8pm Harvest Supper in the Village Hall (see Events for more detail). Join the team or come and learn. Contact Edwin Parrott on 01963 210642 for more information. Our two local chosen charities for 2016, Rendezvous and Future Roots each received a cheque for £163.90 after collections at our Carol and Christmas Eve Services. 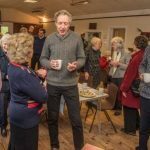 In 2017 our donations were to Dorset Historical Churches £50, RABI £120 (from Harvest Festival), Samaritans £184.50 and Sherborne Food Bank £184.50 (both from Christmas collections). In 2018 our donations went to Dorset Mind and The Leonardo Trust (both from Christmas Collections). This beautiful old Church, dedicated to St Mary the Virgin sits in the Benefice of the White Hart Vale and the Diocese of Salisbury. It is built entirely in the Perpendicular style except for the ancient Chantry which is of the Decorated period. It is thought that there has been a building for worship at this tranquil spot since the 12th Century. 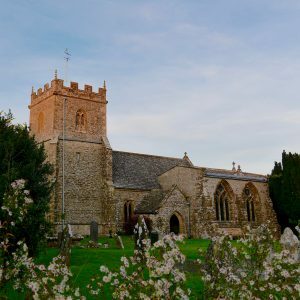 The first de Glanville arrived here around 1216 and became the Lord of the Manor of Glanvilles Wootton or as it was known then, Wootton Glanville. John Hutchin in his ‘History of Dorset’ states that the Chantry was refounded by Sibylla de Glanville in 1344. The figure in the alcove in the Chantry is likely to be that of an early de Glanville, perhaps the husband of Sibylla? The dilapidated nave of the main church was restored in the 19th Century by E.R.Dale, parishioners and friends. This was under the supervision of a local architect G.R. Crickmay who was responsible for the entire restoration of the church. If you have time, look for the special features in the church. On the wooden font cover there is a little mouse ( also one on a Chancel stall) .They are from the ‘House of the Mouse’. The encaustic floor tiles in the Chantry are Victorian replacements of the originals and depict the legend of King Henry III’s protected white stag ( note the stag weathervane) and Thomas de la Lynde who killed it. They include The King’s horseman, the archer Thomas de la Lynde himself and a stag and hound. The carved bench ends are copies of the originals in Hilfield. There is a beautiful decorated piscina and an interesting but curious hagioscope which gives a view of the high altar. Into it leads a smaller hagioscope from under the Chantry arch. As well as the impressive stained glass windows there is medieval glass high in the tracery of the windows. This Church is a gem in Dorset and must be cared and looked after. 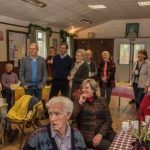 During the year 2016/2017 at 11a.m, every Thursday morning from April to November a group of people can be found in the porch of the Church having their coffee break! They are members of the Church Recorder Group affiliated to NADFAS (The National Association of Decorative and Fine Arts Societies) and are there to undertake a survey recording all the fittings and artistic artefacts that are to be found in the Church of St. Mary the Virgin which is a Church with a 14 Century tower, a 19th Restoration of the main church and with an ancient Chantry Chapel. The project is fascinating and the amount of information that has been discovered is so interesting. Everything is described, measured and noted down with drawings and photographs. This includes textiles, metalwork , paintings ,library, windows, stonework, woodwork and memorials. All this will eventually be put together in a bound book to enable the village now and future generations to discover exactly what is contained in their beautiful Church. 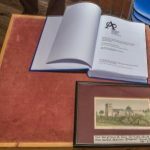 On Sunday 28th January at our Coffee and Chat, the Church Recorders represented to the PCC the completed project in a beautiful blue bound book. 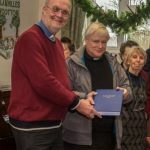 The PCC has decided to purchase another copy which will be on permanent display in the church. 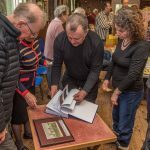 Also at the Coffee and Chat, Margaret Stainer donated a picture of the church (see photo below) to the PCC. Again this will be displayed in the church. 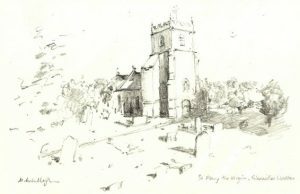 Michelle McCullagh kindly drew this sketch of our lovely church so that we could raise much needed funds for the church through the sale of postcards and notelets. If you would like to purchase any of these, please contact Annie Dove on 01300 345450. Postcards are 50p each and the notelets (including envelopes) are £1 each or 5 for £4. There will also be some for sale in the church. We would like to thank Michelle for allowing us to sell the original in the silent auction at the fête.